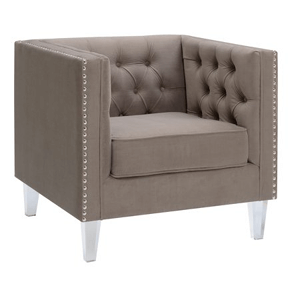 Ariel Collection Contemporary Polyester Velvet Fabric Upholstered Button Tufted Silver Nailhead Accented Living Room Tuxedo Arm Chair with Clear Acrylic Legs, Taupe or Teal You're not boring, your furniture shouldn't be either. Our Ariel Stationary Arm Chair Collection has been designed with high tuxedo styled arms, individually placed accented silver nailheads, soft polyester velvet upholstery, and modern clear acrylic legs. In addition to her looks, our living room chair has been built with a solid-hardwood frame that is corner blocked and glued for extra durability. A sinuous springs system has been combined with cushions that contain 1.8 density foam that sit atop a layer of pocketed coils for added comfort and longevity. Our Ariel chair is the epitome of both style and luxury from the top-down. Be the first to impress your guests, friends, and family. Chair Measures: 30" H x 31.5" W x 29" D and weighs 46 lbs. Some assembly is required. Like what you see and want to learn more about the other products and styles we offer? Check out our entire catalog by clicking on our name right below the title.